What are the two best things in the world for you? For me, it’s food and music. If the two could come in a perfect marriage, it’s a slice of heaven to me. Mind you, I’m not talking about classical instrumental music – I’m talking rock & roll. For a person like me, Hard Rock Cafe is the ultimate experience of food and American music culture. I especially love the rock memorabilia scattered around the cafe. We met up with Ranjit and Nor, Hard Rock’s representatives in KL and they definitely were gracious hosts! From hooking us up with some of the legendary dishes the cafe is most well-known for to answering our questions patiently, we were taken care of perfectly! We had 4 dishes all in all – 1 starter, 2 mains and 1 dessert. Initially we thought it wouldn’t be enough for our group of 5 people, but boy, were we full by the end of our session! Hence this friendly note: the portions are extremely generous and made for sharing! 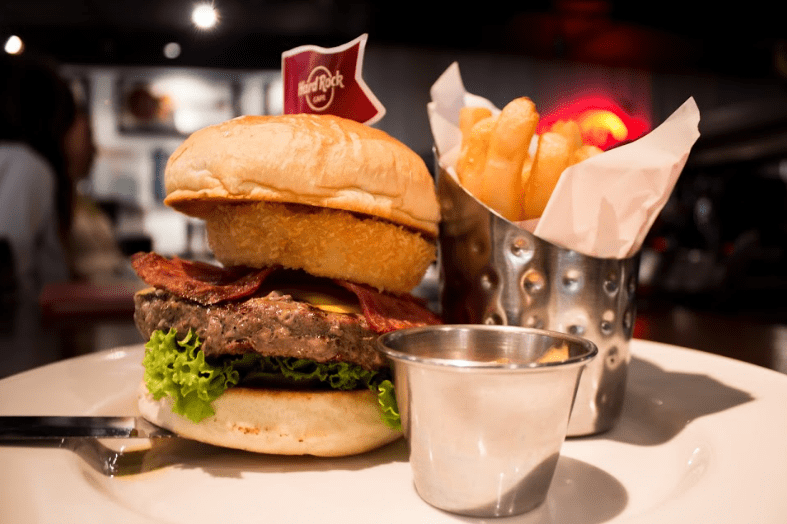 Hard Rock Cafe are definitely well known for their big flavours and big portions and this was evident from the onset. 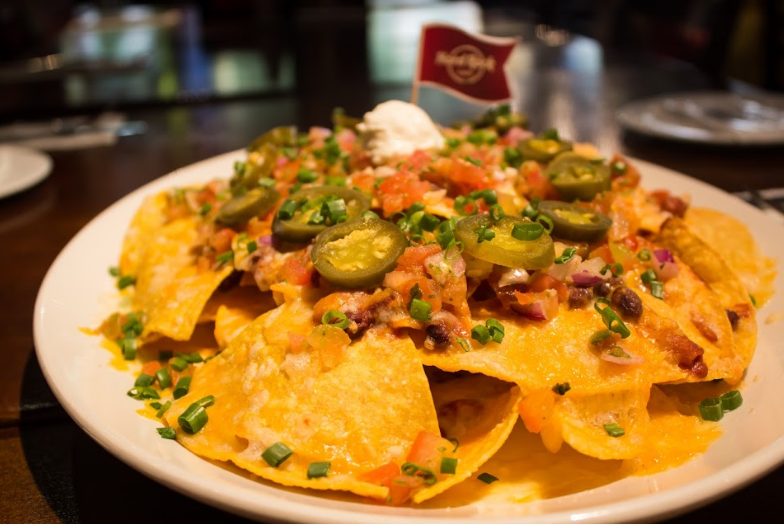 Let’s talk about the appetiser – HRC Nachos. It was a huge platter of nacho chips with beans and a mixture of cheeses, garnished with Pico d, jalapenos and spring onions with a dollop of sour cream. One word to describe it? Perfect. This could be a meal by itself for two people! The salsa complemented the crispy chips perfectly, and the sour cream added a bit of tartness to the savoury dish. Our mains were nothing short of legendary, of course. We made sure to try the Original Legendary Burger – replete with smoked turkey bacon, cheese, a giant onion ring with lettuce and tomatoes. Fries on the side with that? YES PLEASE. The sheer size of it was fantastic, and it was tender, juicy and cheesy, just as how a cheeseburger should be. The seasoned fries were crispy and tasted wholesome. So much love for this one! 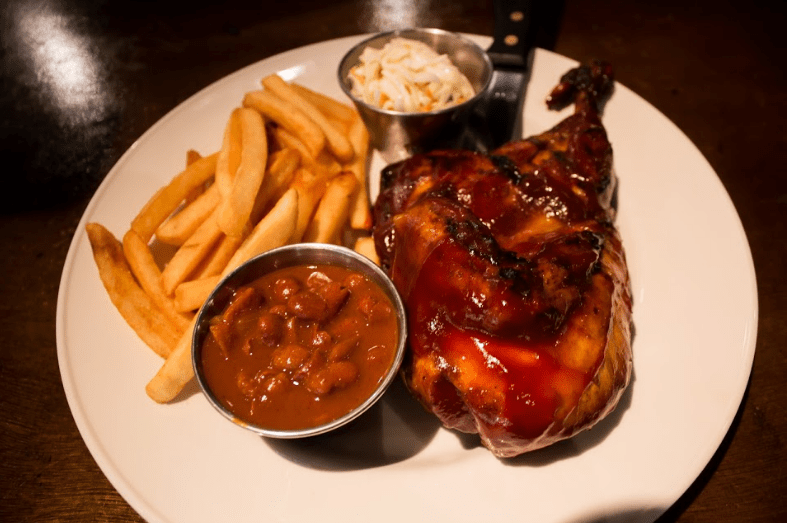 Barbecue Chicken, our second main, was a half-chicken basted in hickory barbecue sauce and roasted until fall-off-the-bone tender. We cannot describe how wonderful the taste was – sour, tangy, sweet and savoury all at once, with juicy well-cooked meat. It was served with seasoned fries, cowboy beans and citrus coleslaw. Personally, we liked it best with the coleslaw – the marriage of fresh citrusy notes with the barbecue sauce’s depths was first-class. Last but definitely not least, our second stomachs were calling out for dessert, and dessert we got! Hot fudge brownie, anybody? 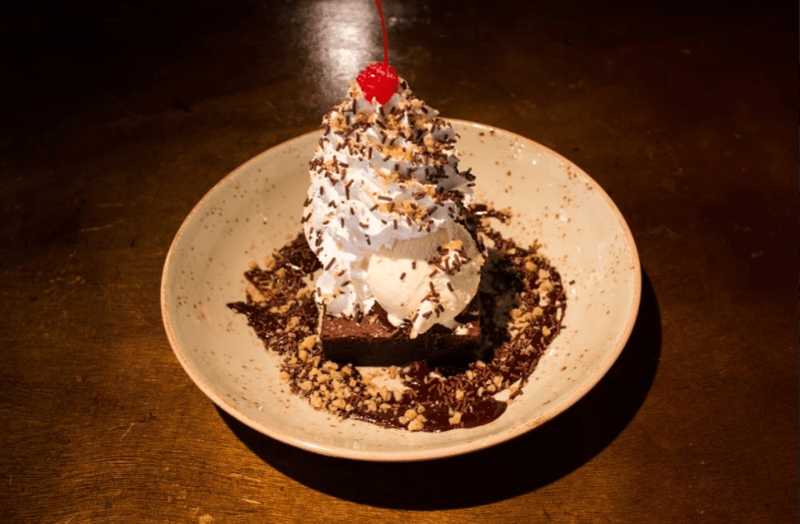 A fresh large square of brownie topped with hot fudge and vanilla icecream, sprinkled with chopped walnuts, chocolate sprinkles and fresh whipped cream – cherry on top, of course! Decadent, lovely and downright sinful, it was a wonderfully sweet and fudgy ending to our lovely lunch! Address: Jalan Sultan Ismail, 50250 Kuala Lumpur, Wilayah Persekutuan Kuala Lumpur.